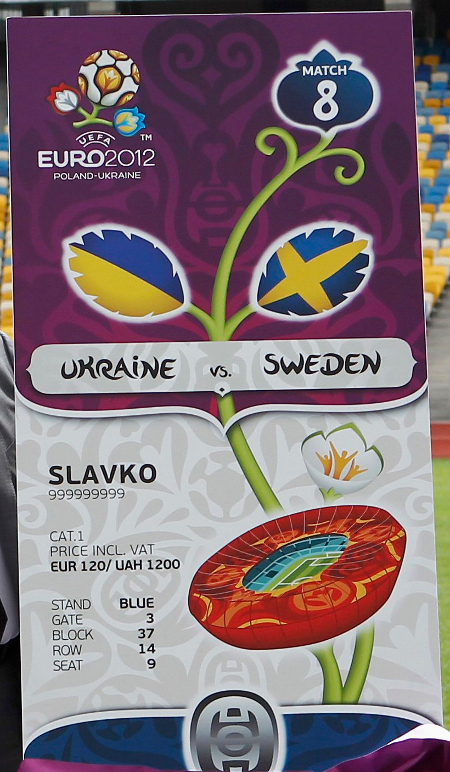 With one month and a half to go before Euro 2012 officially begins this Summer, the design of the match tickets was revealed at Kiev’s Olympic Stadium (the venue for the final) and Warsaw’s National Stadium (where the tournament will get underway on June 8th) this week. The ticket, beautifully colored, is horizontal with a large flower on the front, the leaves of which depict the stadium hosting a match and the flags of the two countries involved. The front also features the number of the match (in a top-right flower bud), along with seat details. Instructions on how to reach the stadium can be found on the reverse, along with a security strip. “There has been talk that the tickets are already in circulation in Ukraine, but it is not true”, said Markiyan Lubkivskiy, Ukraine’s UEFA EURO 2012 tournament director. “We only have the design now. The actual tickets will be received by fans 3-4 weeks before the beginning of Euro 2012 by registered post. The tickets have several levels of protection and it will be almost impossible to imitate them”. While tickets have sold out in Poland, UEFA operations director Martin Kallen reminded fans still interested in matches to be staged in Ukraine that they will get one last chance to purchase tickets next month. “More than 95% of the tickets have been sold”, he said. “About 50,000 tickets will be on sale from the beginning of May, because not all participating federations have taken their full allocation”. If you’re searching for Euro 2012 final tickets, look no further than TicketBis, an online tickets exchange that specializes in helping football fans buy and sell tickets online for almost any match in Europe. Prices for the FINAL MATCH start at £290.00. Speaking of tickets, Italy will be taking on Spain in their first game of the group stage on June 10, and doubtless all seats at Arena Gdansk stadium in Gdansk, Poland will be sold out for this one. UEFA.com has already set up a preview page for the match on their website, with some pretty interesting information including head-to-head record, form guide, and team ties (which players crossed paths, played together before, that sort of thing…). ITALY (4-1-2-1-2): Buffon – Maggio, Criscito, Ranocchia (77′ Bonucci), Chiellini – De Rossi (65′ Aquilani) – Motta (46′ Marchisio), Montolivo (74” Nocerino) – Pirlo – Cassano (59′ Balotelli), G.Rossi (59′ Pazzini). COACH: Prandelli. SPAIN (4-4-1-1): Casillas (46′ V.Valdés) – Arbeloa, Albiol, Piqué (45′ Busquets), Iraola (46′ D.Villa) – Cazorla (80′ Mata), Javi Martínez, Xabi Alonso, Iniesta (46′ Thiago Alcantara) – D.Silva – F.Torres (15′ Llorente). COACH: Del Bosque. SPAIN (4-4-2): Casillas – S.Ramos, Puyol, Marchena, Capdevila – Iniesta (59′ Cazorla), Senna, Xavi (60′ Fábregas), D.Silva – F.Torres (85′ Guïza), D.Villa. COACH: Del Bosque. ITALY (4-3-1-2): Buffon – Zambrotta, Panucci, Chiellini, Grosso – Aquilani (108′ Del Piero), De Rossi, Ambrosini – Perrotta – Cassano (75′ Di Natale), (58′ Camoranesi), Toni. COACH: Donadoni. ITALY (4-4-2): Pagliuca – Tassotti, Benarrivo, Costacurta, Maldini – Conte (66′ Berti), Albertini (46′ Signori), D.Baggio, Donadoni – Massaro, R.Baggio. COACH: Sacchi. SPAIN (4-4-2): Zubizarreta – Ferrer, Otero, Abelardo, Sergi (60′ Salinas) – Goikoetxea, Bakero (65′ Hierro), Alkorta, Nadal – Caminero, Luís Enrique. COACH: Clemente. After Spain, the Azzurri will look to face off against Croatia on June 14th and the Republic of Ireland on June 18th. Full Group Stage matchlist below. 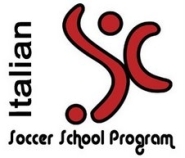 For Spain vs. Italy tickets or any of the Azzurri Euro 2012 matches, make sure to check out TicketBis online. This entry was posted on Tuesday, April 24th, 2012 at 4:16 am	and is filed under Azzurri, Euro 2012. You can follow any responses to this entry through the RSS 2.0 feed. Both comments and pings are currently closed.